This fantastic 19 day adventure for bird-watchers, focuses on Namibia's amazing birdlife, from the dry south to the lush north, it starts in Windhoek and ends at the spectacular Victoria Falls. We depart early from Windhoek, travelling south towards the Kalahari Desert. This beautiful semi-desert area of red sand and rolling dunes is also home to a wide variety of plants and animals. Dunes are dotted with patches of yellow grass, while shepherd trees and thorny acacias add shades of green. The Kalahari supports herds of oryx, springbok and ostrich, as well as cheetah, zebra, jackal, porcupine, badger, mongoose and many more. This area is home to the Kori Bustard, the largest flying bird of all, and huge colonies of weaver birds are resident on the lodge's grounds. Lüderitz is a quaint, harbour town, known for its German colonial architecture. 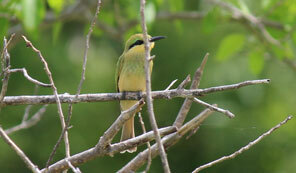 We visit Diaz Point and do some bird-watching at the lagoon. Dinner will be at the restaurant and we overnight at the Nest Hotel or similar. After breakfast at the hotel, we depart for some bird-watching with the guide along the harbour. We visit Kolmanskop, the famous ghost town which lies abandoned in the sands of the Namib. It grew out of a diamond rush in the early 1900s, but was later abandoned when the diamond-field was exhausted. We continue towards Sesriem, passing by the wild horses. Lunch packs will be had en-route. We will do some bird-watching at the Walvis Bay Lagoon with the guide, updating our checklist of birds seen so far. Dinner will be at the Pelican Bay Hotel. After breakfast, we will embark on a boat cruise which includes a wonderful brunch (no lunch). Get up close and personal with seals, dolphins and pelicans. Other possible sightings include whales, penguins, cormorants, petrels, gannets and oystercatchers. Enjoy a variety of seafood, soft drinks and sparkling wine. Dinner will be enjoyed at one of the restaurants in town. We travel north along the beautiful Namibian coastline to visit Cape Cross, home to one of the largest breeding colonies of Cape Fur Seals on the planet, with up to 210 000 seals present during November, December. Many species of coastal birds are often present here. Today will be a full day of safari game viewing allowing plenty of opportunities for good sightings and spectacular photographs of African birds and wildlife. Dinner will be at Halali. We have breakfast and depart early for a game drive in the eastern side of the park. Lunch will be enjoyed at one of the resorts inside the park. We meet to discuss and update our checklist for the day. We have breakfast and depart early (the best time for seeing birds and animals) for another game drive in the eastern side of the park. We depart the park in the direction of Grootfontein where we will stop for lunch before continuing our journey to Rundu. After breakfast, we embark on a game drive in the Mahangu National Park. This small game reserve is abundant in wildlife and offers great opportunities to see four of the big Five – Elephants, Buffalo, Lion and Leopard. More than 300 bird species are found here. The park is famous for its collection of wetland birds; including egrets, cranes, herons, pelicans, storks and various birds of prey like Pel's Fishing Owl and Montagu's Harrier. 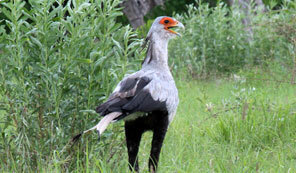 The park has even been designated as an “Important Bird Area” by BirdLife International. Look out for the very large Baobab Trees which are numerous in the park. Breakfast will be enjoyed at the lodge. We visit a nearby traditional village before departing towards the Caprivi region via Katima Mulilo. We arrive a Camp Chobe, near the Ngoma border post to Botswana, in time for lunch. In the afternoon, we go on a boat cruise on the Chobe river to experience African wildlife and birds as well as its stunning landscape on this perennial river. A birdwatcher's paradise, the rich and diverse habitat of the reserve is home to a surprising diversity of birds, with almost 500 species, from water birds to forest dwellers. Look out for hippos elephant and crocodiles. We have dinner and overnight at Camp Chobe. After breakfast, we cross into Botswana and continue to Kasane. 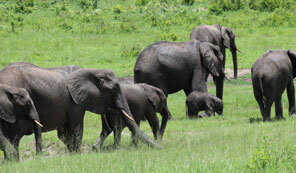 We enjoy a game drive in the Chobe National Park and have lunch at the Chobe Safari Lodge. We transfer to Victoria Falls from Botswana to Zimbabwe (Remember the Visa - US$30 pp)). We arrive at the Victoria Falls and check in at the Rainbow Hotel or similar. We enjoy a sundowner boat cruise on the Zambezi river. Dinner will be at the hotel. Today, we visit the spectacular Victoria Falls (Zimbabwe side), considered the largest in the world. The thundering waters can be heard from 40 km away while the spray and mist rise to a height of over 400 metres. The afternoon is free for some optional activites. We take final stock of our checklist of all the birds seen during our tour. We enjoy a farewell dinner at the Rainbow hotel or similar.